Aww, look at wide-eyed innocent me back at the beginning of 2018. So full of hopes and dreams! This year was bonkers but I feel good about what I accomplished. While I didn’t knock any major writing projects out of the park, I did some work that I’m proud of, had a small piece published, and committed to practicing the craft of writing fiction, which has always overwhelmed me in its difficulty. Also, I took care of myself! I practiced yoga regularly, once for 27 out of 30 straight-ish days, and kept up with cardio. I ate spinach and kale by the fistful in mason jar salads and green smoothies more often than going out to buy lunch. I got enough sleep and drank enough water and meditated. And I traveled! Boy, did I travel: mechanical bull riding and Magic Mike in Las Vegas, karaoke and hangover brunches in New Orleans, castles and craft beers in Denmark, pastries and parks in Sweden, conferences and interactive theater in New York City, writing and drinking in Wisconsin, stand up paddle boarding and kayaking on the Chain O’ Lakes, camping through a snowstorm in Upper Peninsula Michigan, sleeping in a van listening to coyotes in Manistee National Forest. What a full year, and as someone who could barely afford the time and expense of leaving the Midwest for much of my earlier adulthood, this life feels like such an enormous gift. So I didn’t write 6 hours a week, or master a handstand, or completely kick sugar. I had some crappy setbacks and work struggles and stressful months along with the amazing months, but of course that’s life, and it’s not what I choose to dwell on. I want to carry good vibes only into 2019. Become more conscious of my carbon footprint. Cut back on my use of plastics. Recycle, but reuse even more. Be less wasteful and more mindful. Keep up with healthy eating, and continue to cut back on sugar and processed foods. Learn how to use the damn instant pot. Meal prep. Keep practicing yoga and doing cardio. All movement is good, whether it be dancing to karaoke or walking across a new city. Every day is Leg Day. Keep writing. I have two ideas for longer projects; pick one and commit to working towards a full draft. Blog and write about travel and pop culture opinions. Put the damn thoughts on the damn page. Keep traveling whenever and wherever I can. Keep jumping in as many Midwestern lakes and rivers as possible. Be more mindful of my budget. Sit down with Kurt and look at our current and future financial goals together. Reading Nomadland this year really opened my eyes in terms of thinking about our eventual retirement, and though I do the “right” things (have a 401k, pay off credit cards), I still (STILL!!) have a student loan to pay off, and a tendency to run off and make a tattoo appointment the second I have some extra cash on hand. Organize my house and my digital life. Let’s not talk about the current state of my digital photo hoard. Every week: Submit, Pitch, or Apply. Whether it be finding a home for a piece or trying to get into my first writing residency, it’s only going to happen if I keep putting myself out there. For the month of March, I set a challenge for myself to do yoga every day, aiming for 30 practices total (giving myself a rest day halfway through). I mostly completed my goal, practicing on 27 out of 31 days. So, I took a few days off but if there’s anything I’ve learned from yoga, it’s to be forgiving to myself when I’m not perfect. In order to fit 30-75 minutes of yoga into my daily routine, I eliminated my usual cardio workouts from my week, instead focusing on getting on my mat. This was the perfect challenge for me at this time; I’ve been wanting to expand my practice and increase strength and flexibility while also maintaining my daily meditation habit. I mostly went to power vinyasa studio classes which run 60-75 minutes long. On the days I practiced from home, I used the Cody App which I like for the variety of classes. As a former roller derby skater and Crossfitter, yoga is a big change of pace for me. 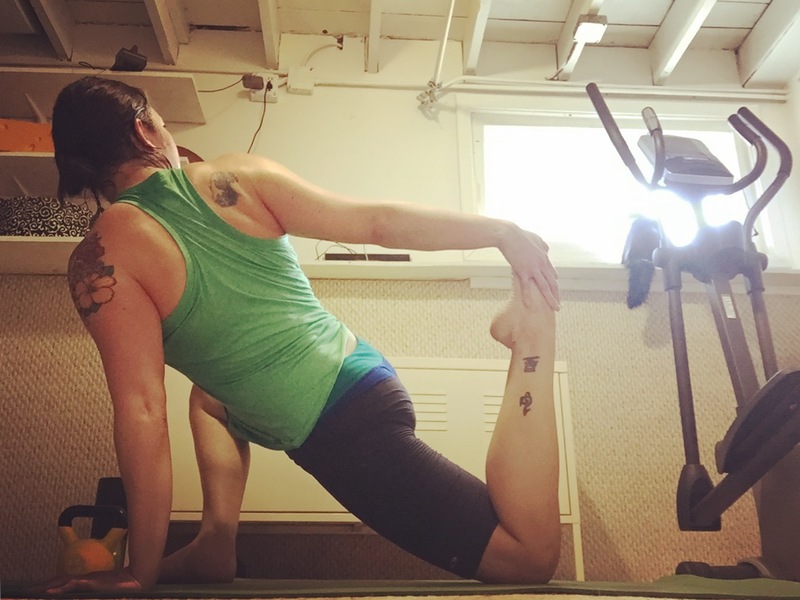 In the last few years, I’ve been leaning towards the more slow and deliberate pace of yoga and Pilates, mostly because of the limitations I have in my knee after my injury 7 years ago and subsequent surgery. I can’t do All The Squats anymore, which makes me sad. But with yoga, I’ve found a way to increase my strength that doesn’t also make me constantly fear injury. And spoiler alert–I’ve gotten pretty damn strong and I kinda even love side planks now. I went to the doctor for my annual physical, and I was nearly an inch taller than I was last year! That’s what daily stretching will do for your spine and overall posture. Blocking out time on my calendar helped me prioritize fitting the daily practice into my crazy schedule. Much like with my vision board, seeing it on my list of to-do’s for the day was the key to sticking with it. My body awareness has become more heightened. I notice all the tiny differences in flexibility on my left side vs. my right, my strengths (quads and hammies) and tightness (my lower back has zero desire to bend but I’m slowly making gains but will likely hate camel pose forever). 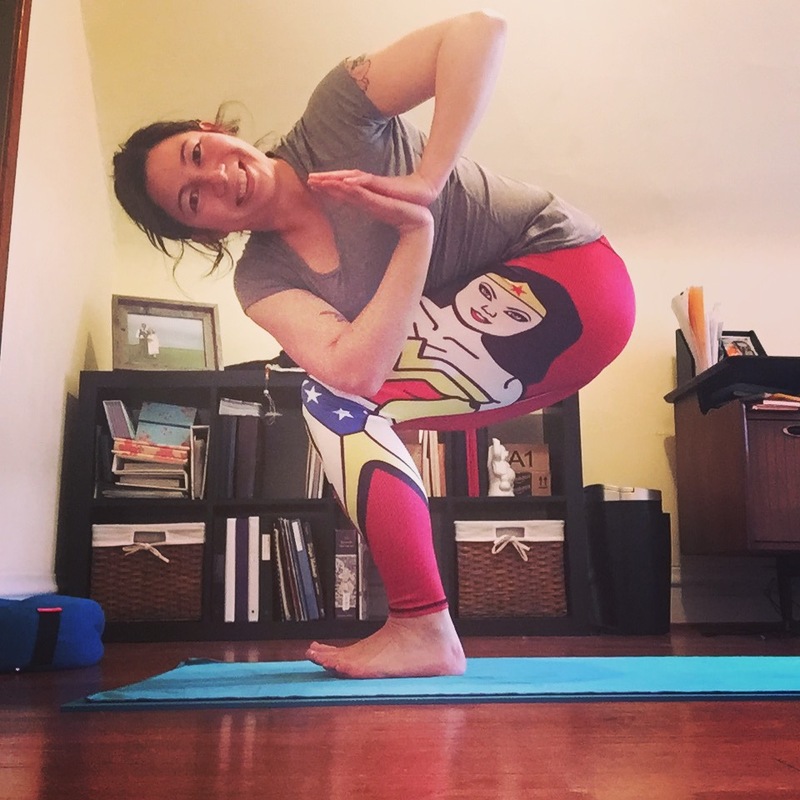 Taking a selfie in a yoga pose using a 10-second iPhone timer is the greatest challenge of all. Everything on Instagram is a lie. It takes a village to get that perfect image you just scrolled past of a social media influencer in perfect Eka Pada Galavasana in front of a waterfall in Belize. Now that my self-imposed challenge is over, I’m adding cardio back into my routine a few times a week, but I plan to keep yoga as my main form of exercise on most days. When I first came up with the name for this blog, I envisioned it as a place where I’d write about health and fitness for the drunk and lazy. The focus of the blog eventually evolved into something different, but fitness (and occasional drunkenness) remain a regular part of my lifestyle. During the recent onslaught of back-to-back-to-back holiday parties, I did a terrible job of focusing on health and fitness and fully gave in to be drunk, lazy, and gluttonous. It was such an indulgent binge of ridiculousness that I’m actually looking forward to getting back to some healthy habits now that New Years is over. And you guys, guess what?? Sometime in the past year I got really into yoga. I used to hate on yoga because I thought it wasn’t enough of a workout. I used to play roller derby and do Crossfit, so in my mind, if I wasn’t burning out my legs by alternating wind sprints with wall sits, or flipping giant tractor tires while grunting and howling like a zoo animal, I wasn’t really getting in shape. Yoga was for girls who spend $100 on stretchy pants and wore them to Starbucks as often as they did to the studio. I am fully willing to admit I was wrong (well, those people do exist, but if they have the strength to pull off a perfect side crow pose, they’ve earned the right to trot out those LuluLemons anywhere they please). I’ve also come to enjoy the meditative quality of yoga, which is especially surprising considering I’m the type of person who can’t look at Facebook for more than 5 minutes without ADD kicking in and making me switch to Instagram or Twitter. My husband once watched me play with my phone over my shoulder and he said it made him dizzy. During a 75-minute yoga class, I can shut off that part of my brain and find an inner calm. Looking ahead into a bright shiny new year, I definitely plan to continue to make yoga a part of my day as often as possible. Though I still may flip some giant tires; a girl’s gotta live a little.